It is a tempting proposition for people when they are charged with a crime: avoid jail and go on probation / deferred adjudication. But is it really that good of a deal? The obvious first: you do not have to go to jail if you abide by all the conditions of your probation / deferred adjudication. You can continue to lead a fairly normal life, so long as you abide by all the conditions. This is great for people that want to continue to work or go to school. If it is deferred adjudication, another reason it may be a good deal for you is that, so long as you complete it successfully, you will not have a conviction on your record. Additionally, if you complete deferred adjudication, you may be able to get the records related to the offense “sealed’ through an Order of Nondisclosure. However, this only will prevent its disclosure from public inquiries; Law enforcement and state licensing authorities (Eg…Board of Nursing, State bar of Texas, teachers, pretty much any licensing authority). It can be a tightrope walk. You may be facing a LOT of conditions, ranging from fines, fees, ignition interlocks and home alcohol monitoring devices (and paying for their associated maintenance and calibration fees), community service, court ordered classes, the list goes on and on. If you fail to do any of these things, any one of them by itself can be enough to revoke your probation and sentence you to jail (or adjudicate you guilty and impose a sentence). Also, if you fail a urinalysis test, you could wind up with a conviction. Not all offenses qualify for an order of Non-Disclosure – that means that, although you do not have a conviction on your record, all the other information relating to the arrest, charges and disposition remains on your record forever (For example, Assault Family Violence can not be “sealed” by an order of non-disclosure). If you mess up, you will go to jail until the Court addresses the alleged violations of the terms of your supervision. if it is straight probation. If you mess up, you could end up doing more time than if you took jail/prison up front. 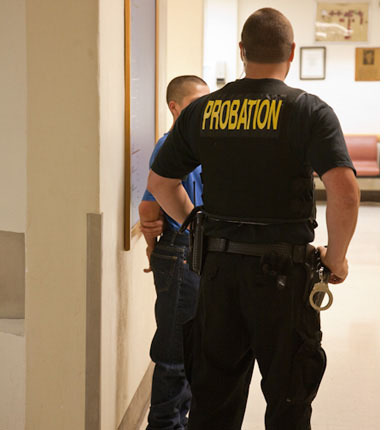 If it is Straight Probation (like a DWI), then you can be sentenced up to the length of the probationary term. If it is deferred adjudication, however, you could be sentenced to the full range of punishment for the offense. For example, if you are on deferred adjudication for Possession of 1-4 grams of cocaine for a period of 3 years, and you violate, you could be sentenced to up to 10 years! This is because the range of punishment for that amount of cocaine is up to 10 yrs in TDC. People are generally overly optimistic of their chances to complete probation. It is a lot to deal with, and you need to b honest with yourself. If you have been arrested before, what makes you think you can stay out of trouble now? You certainly might be able to make a paradigm shift in your life, even though you have a wrap sheet a mile long, but you need to be realistic. Consider your options carefully, and discuss ALL the consequences of your plea of guilty and imposition of a suspended sentence with your attorney. There may be other options available that fit your situation.